Not to be confused with World 7-10. 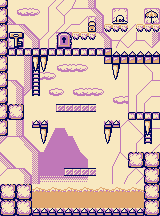 Stage 7-10 is the tenth level of the Iceberg in the Game Boy version of Donkey Kong. The level revolves around using Icicles. Mario starts on the ground right to a river with a lone Bukubuku. Above him are a pair of Icicles. Mario must jump to the platform to the left, and jump to the left once again to reach another platform, which has a ladder thats one tile to short to climb, thus the player must wait for icicle on the ladder to drop, giving the player a temporary platform to use to climb the ladder. The ladder leads right to a platform which is right to a set of spiky platforms which the player must let fall to use as platforms. This must be done again but using one of the icicles as a boost of height to reach another ladder. Up the ladder is the key which is right next to the door which must be used to clear the level. Purse: Above the Ice Blocks. Hat: Above a set of Ice Blocks Right to the previous set. Parasol: Above a set of Ice Blocks Right to the previous two sets. This page was last edited on September 7, 2018, at 02:27.